Guidelines for learners' Carbonmade homepage and template choices. 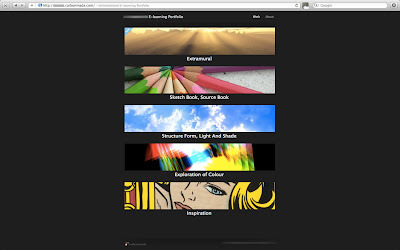 Written for Visual Arts and Design learners using Carbonmade and their educators. What is your portfolio for? Before making choices, its important to reflect on your reasons for using an online portfolio. Creating a quality portfolio takes a good understanding of what you want to express, how to achieve it and how you would like your audience to interact. To show your interests in an amateur, visually creative hobby. I suggest you write down your goal(s) and use this to motivate yourself to create an online portfolio that truly helps you achieve your aims. Once you know the reason(s) you are creating an online portfolio, you should have a sound basis for choosing a name and its website address. 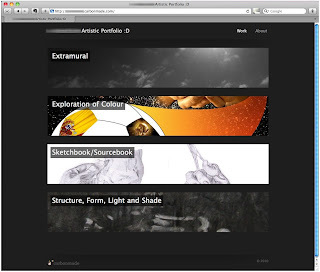 Your online portfolio title can be based on your; genuine identity (i.e. your real name), your nickname, a pseudonym, a fake name, a corporate identity or your particular interest (i.e. subject, theme or medium). Whatever your choice, make sure it is well-aligned to your online portfolio's aims, unless your aim is to confuse your audience :) ! As a free user of Carbonmade, your website address will be your portfolio's title inserted between http:// and carbonmade.com (i.e. http://amymullen.carbonmade.com). Carbonmade offers just two choices for a background colour; either 'black' or 'white'. In making your choice, it is useful to think of the resonance that your colour choice creates. 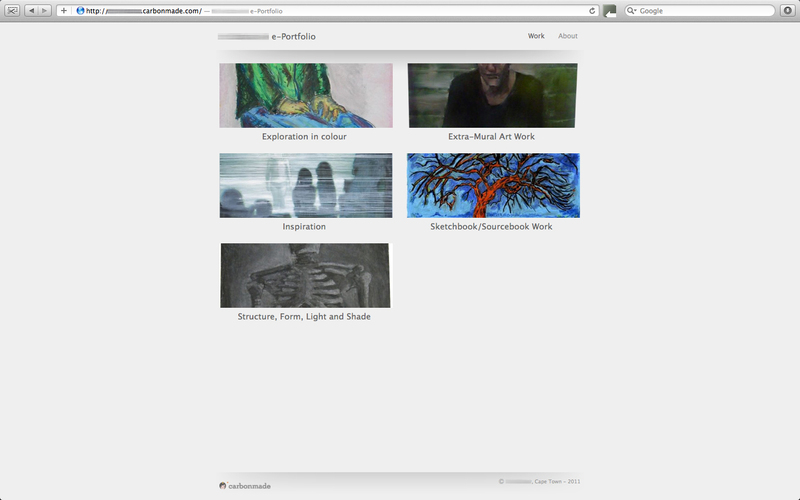 For example, a white background can suggest a sketchpad and is well-suited for portfolios that feature many drawings. A black background suggests a screen or film negatives and is often highly appropriate for mixed-media, photographic or film portfolios. Carbonmade offers three design choices for the layout of your homepage's artwork folder covers; either one, two or three thumbnails per row. If you want to create a cinematic effect, then the one thumbnail option works well. It is also well- suited for artworks in landscape format. If you prefer a look that is more similar to a gallery, then the two or three thumbnails option is more appropriate. Please visit my tips to name your online portfolios for advice on choosing folder names, if your educator hasn't given you specific instructions. Your artwork folder covers can either be the first artwork that is inside them, or show an image that does not feature in the folder itself. You can choose whether you there's merit in having artwork or designs that are especially chosen as folder covers, or whether your first folder image does the job. Copyright your online portfolio's content using your footer. Your Carbonmade online portfolio's 'header' section is at the top of every webpage and features your online portfolio's name and the 'Work' and 'About' buttons. You can also add a footer, which will appear at the bottom of every page. I recommend that you use this space to assert copyright for your website. To do this, insert the copyright symbol © in front of the year your online portfolio was first-published and then list the copyright owner. For example: © 2010 Travis Noakes. 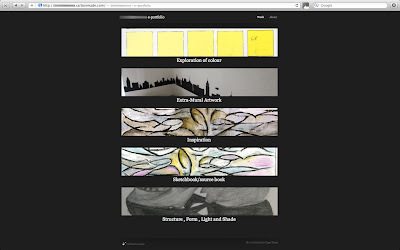 It is also a good idea to do the same for each artwork, when you label each newly uploaded one. I hope this advice proves helpful. Should you need more, kindly review my online portfolio posts. Comments welcome in the box below, thanks.